So you’re going on a trip in a charter bus. Congratulations, you’ve made a good choice! Traveling in a charter bus is one of the best and safest ways to get a group of passengers from point A to point B. Whether you’re taking a tour of California’s wine country, taking a group to Disney, or transporting your guests to a destination wedding, we are confident that you will find charter bus travel to be a valuable and affordable option. But the longer your drive, the more likely it is that you will become uncomfortable before you get there. This can be hard on your body and leave you cramped and stiff by the time you get there. However, there are things you can do about it. Here are some tips from our charter bus company in San Francisco for how you can be as comfortable as possible. 1. Bring a neck pillow. Holding up your head when you’re getting tired is a terrible plan. Our heads, which are so perfectly balanced on our necks while we’re awake, become like large, heavy bowling balls that we don’t quite know what to do with when we’re falling asleep. And when you’re on a bus with no place to lie down, you definitely need a neck pillow to help to support your head. Otherwise, you’ll awake with a crick in your neck and aches in your back from the weird position you fell asleep in. It should go without saying, but if you have a long bus trip before you, the more comfortable your clothes, the better. Wear loose-fitting clothes made out of softer fabrics, and be sure you’re wearing comfortable shoes. You’ll thank yourself after 2 hours in the bus if you don’t have your clothes binding you in a weird spot. 3. Sit by the window. Sitting by the window gives you a greater combination of body positions to choose from, and sometimes when you’re getting cramped and sore, you just need to be able to change your posture. When you sit by the window, you’re not limited to changing between crossing and uncrossing your legs and leaning your head up against the seat in front of you. You can also lean against the window and even almost shift to sitting on your side. 4. Or, sit on the aisle. For taller passengers, you’ll generally find that the worst part of being in your seat is having your legs cramped up in a space that is just barely big enough for them to fit. Do yourself a favor and sit in an aisle seat so that you can stretch your legs out straight from time to time. This is not only good for your comfort, it’s good for your circulation, too. There’s no substitute for helping your blood to circulate and your muscles to go back to normal. Moving around periodically is a great idea to ensure that you put less stress on your body as a whole. This can make a big difference in letting you emerge from the bus feeling as normal as possible. 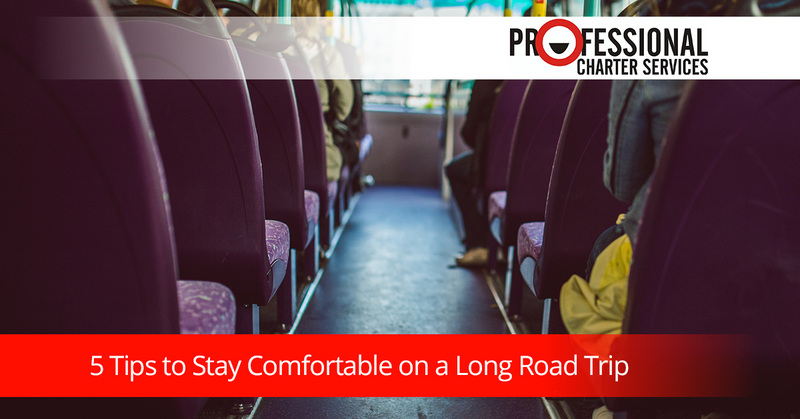 When you need to rent a charter bus in San Francisco, look no further than the friendly folks at Professional Charter Services. We look forward to serving you! To get started, simply ask us for a quote.